When Hans started flying his 701 it was the first of type in the area, and he was fairly satisfied with its STOL performance compared to other aircraft around. But when I started flying my Savannah it was noticeably better at STOL. That was a bit frustrating for Hans because he especially bought the 701 for its STOL reputation. The 701 was a bit faster at cruise, but that was when we both still had slats. When I pulled the slats off the Savannah and replaced them with VGs the STOL performance improved even more, and cruise improved dramatically. Now Hans was really frustrated, since his 701 couldn’t perform nearly as well, both in STOL and cruise. So he pulled his slats and added VGs, and then the 701 passed the Savannah in cruise. But he was still frustrated that he couldn’t match the STOL performance of the Savannah, no matter what techniques he tried. Then he flew the Savannah and realized that it wasn’t his ability, it was the aircraft that made the difference. The obvious difference between the aircraft was the wing span, so we decided to extend the 701 wings to match the Savannah. That was the key, and now he can pretty much match the Savannah – the improvement in slow flight performance of this longer wing is very satisfying, especially at full load. His modified 701, with longer wing and VGs instead of slats, flies a heck of a lot better than the original! Such is the true story of how these discoveries evolved. Subtracting just that cutaway (5 ft) and adding the extra span (2.6 ft), the Savannah wing has 7.6 ft more full profile ‘working’ wing – that’s a heck of a big difference! Those stubby little wings on the 701 sure do work hard, and do a remarkable job, but they just can’t match the extra span and area on the Savannah. We added 400mm (16”) each side of the 701 to make it the same span as the Savannah. That increases the overall span by 2.6ft and the area by 11ft2. You wouldn’t think that such an increase would make such a big difference in performance, but it certainly did. 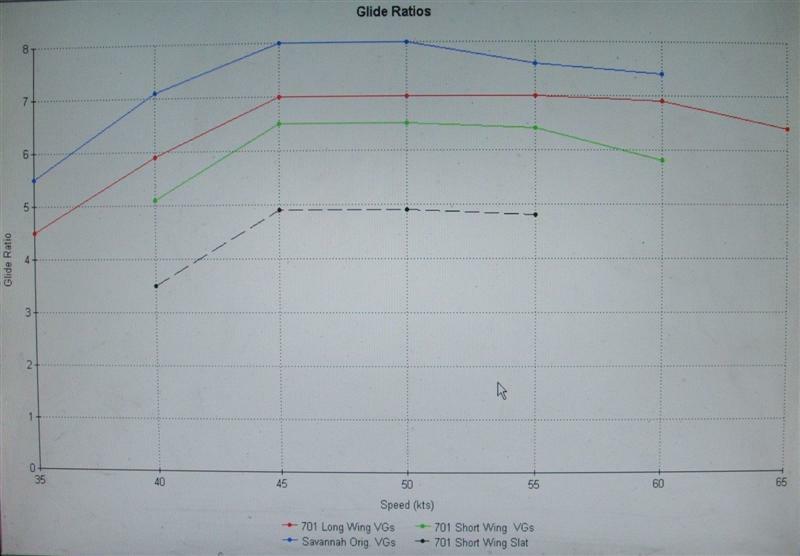 The Lift to Drag Ratio (as measured by the Glide Ratio) for the Long Wing 701 is now much improved over the short wing. The short wing wouldn’t really glide at all at 40kts with prop-stopped (descent +800fpm and poor control), now it’s a good glide at 40 and still flyable at 35kts. Slow landings are now much slower, and much better control – much better ground effect cushioning. The tendency now is to float on – the standard 701 never did that.... The effect of the 15º flaps improved considerably when the slats were removed, but seems to be even better now with the longer wing. Now he can round out and then hold off with a trickle of power, getting slower and slower and higher AoA, until it settles on gently at a very slow speed, with the nose way high – it’s just beautiful to watch! Take-off roll is much shorter than before – almost immediate rotation and lift-off into ground effect. Climb rate is 100fpm better at 40kts, so better angle of climb out of tight spots. This would figure in the lower induced drag of the longer wing at slower speed. 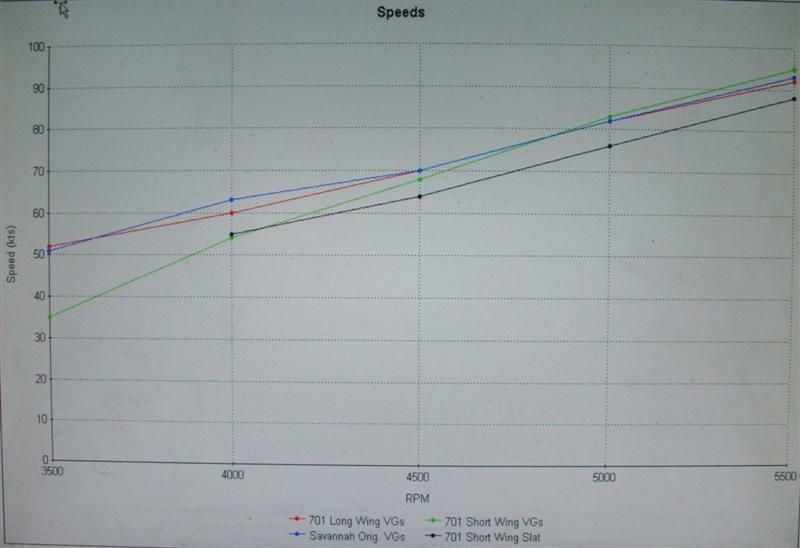 Best rate of climb speed is unchanged at 55-60kts. Fast cruise at 5000rpm is 82 kts, which is only one knot less than the short wing. Of course, lengthening wings like this has serious structural implications. We’re not qualified engineers but have considerable practical experience with the structures of several aircraft. Having assembled two Savannahs and repaired three extensively damaged 701’s we were able to do direct comparisons. There are differences between early spars and the SP model, so caution is advised. We believe that the modification we have made is as least as strong as a Savannah wing, which has a considerable flying record already. We’re not qualified to advise others how to do this mod, but one method that's been used very successfully is to get 750 plans, and build a 750 wing for the 701 - that works really well! Stall (that's if you can call it a stall) with just me is so low it's difficult to measure, but seems to be around 30mph with a 200lb copilot! This larger wing would be really great all for those float flyers carrying 1200lb!! !